Do designers know how good their games are? In video games we are seeing emphasis on games that enable community creation that in turn contributes to the enjoyment of the rest of the people who play the game. This has existed for a very long time in the form of mods and variants, but it is now "institutionalized" in games such as Spore and Little Big Planet; in fact, in the latter it appears to be much of the point of the game. The creators of these games have made it very easy for players to create additional "content" that can easily be used by others, even more than the scenario editor in Civilization games or the level editors in shooter games such as Unreal Tournament. This is a form of "crowd-sourcing", using non-professionals to provide content sometimes as good, or nearly as good, as professionals can provide, but at no cost. Video game companies simply cannot afford to create the vast amount of content gamers now expect, yet gamers want it for no additional cost (complaints about the $60 standard price for video games are common). So they're finding ways to have the fans create the additional content. My question is, how do we incorporate such "community creation" features like modding/creature creation into boardgames? Collectible card games have something like it except it's all publisher-created. RPGs have had it (all the D&D monsters, classes, adventures) since their beginning. Diplomacy has it in the hundreds of variant created over the years. Some wargames have it in additional scenarios created by fans. But is there a way to make it part and parcel of a game or of gaming? How do we get something that supports the game and is created (and distributed free) by the fans, the players? BGG is as close as we get, generally, but how many players come to BGG on a regular basis? Not many, really. Well, if I knew the answers, I wouldn't be asking the question. While it's a video game site, the article applies just as much to non-electronic games. As I write, they're $9.50 (plus shipping) for 500 in ten colors. EAIEducation is also my best source for plastic cubes, two-sided disks, one-inch plastic square counters, and other useful game components, usually in bulk. You might want to read my design article "Why We Play" on GameCareerGuide. You can click on the title of this post. This should be of interest to anyone who wants to design games. How well do designers understand how good their games are, or how well they will sell (which is two somewhat different things)? Reiner Knizia (over 200 games published) recently said that his game Pickomino has quite surprised him. Pickomino is a dice game with scoring tiles that's fairly simple, but has become a big seller. In my own case, 25 or so years ago, after I had had some games published, I had four that I felt were "my best". One of those was Britannia, and it *has* turned out to be a "classic". The other three have not been published. I've revised one quite a bit, that a new publisher appears to be interested in, another has been played a few times recently but I haven't submitted it anywhere, and the fourth is "old fashioned" in a way that might not work well nowadays, but it's only been played once or twice in 25 years. I don't work on the three much, because I have several games designed recently that I feel are better. But do I really know? No. Only repeated playing by lots of groups can tell you how good the game is, and even that won't tell you how well it will sell, as there are many factors in selling other than the quality of gameplay of the game. I'm especially interested because I've used my reduced-scale "gateway" system recently for Chinese history, and because I have one of the few copies extant of the original China Britannia, The Dragon & the Pearl (now out of print), which covers about 200-1300. I am by no means an expert on Chinese history, though I have in fact read something as obscure as the Romance of the Three Kingdoms, so I'll have some comments on the historical aspects of the game. 4th Edition D&D is out, and I've read some of the Player's Handbook. First Edition (second was not much different, so I discount it) let you play "wargame D&D" or "story D&D" as you liked--D&D as a competition or as an entertainment. Family games tend to be entertainments. Party games, ditto. Euro games, often. Wargames, they're usually competitions. As Desslock, the well-known PC Gamer reviewer of RPGs says, recent versions of D&D were too "Crunchy", that is, the barriers to entry are too high because generating and understanding a character takes so long. In First Edition you could get players going in 10 minutes, if you needed to. And there are barriers in the play, as well, which tends to become too complex for many. In 3.0 or 3.5 it takes closer to an hour. It is also much more "fiddly" to devise adventures. I've played 3.0, and refereed from modules, but I never made up a 3/3.5 adventure owing to those fiddly barriers (primarily the skills, feats, and ability modifications). I've always treated D&D as a wargame that's entertaining--we ALWAYS have used a square grid board. 3/3.5 emphasized wargame and (at least insofar as it's "Crunchy") lost track of the entertainment. 4th edition appears to have recast D&D as an entertainment--something like a movie--rather than as a strategic game, by eliminating most of the more difficult decisions such as when to use a very limited set of spells. First Edition is long gone. Hackmaster revived First Edition, but with its own complications and an annoyingly foolish notion that the referee and the players are actually competing with one another. (Any referee who can't kill off players EASILY, if he wants to, is incompetent.) Castles and Crusades seems to be the spiritual descendant of First Edition D&D. 4th edition appears to be an attempt to go back to the simplicity and non-crunchiness of First Edition. But the uniformity of it is very striking, and I wonder how that will affect long-term enjoyment. There are not prestige classes and skills and feats galore to unbalance the game, nor does it appear that this is wanted. Instead, every class has several powers (at-will, once per encounter, once per day). And the powers tend to read with a remarkable sameness regardless of the class. Even the wizard is no different, in melee, though at other times he is more likely to use rituals (equivalent of spells that take longer than a round to cast). Competitions require planning and difficult choices, whereas entertainments reduce the number of choices to several plausible ones, and tend not to require planning. Family/party games are at the extreme of entertainment. 3/3.5 was aptly described by one speaker at Origins as "Fantasy Squad Leader", at the other end of the spectrum where wargames live. It was designed to cater to players who wanted to find the most powerful combination of rules and skills and feats, and worse, it was designed so that vast numbers of additional skills, feats, and prestige classes became available to players, so that it wasn't even a self-contained wargame but an evolving one, kind of like a collectible card game where the rules must be broken every year so that the best combinations change over time. I remember advising First Edition referees that players do all they can to find unearned advantages, and the referee's role was to quash that. But 3/3.5 enthroned it as a virtue. There is little of that extreme min-maxing in 4th edition, and that should be an improvement for most players. But I need to read a lot more of the Player Handbook before I can say these things definitively. At present it appears it would be an interesting game to try, but I wouldn't referee it. And while it's a fantasy role-playing game, and might be a good one, it isn't D&D any more. While at Origins I try to keep an eye on the age, gender, and race of the attendees. My impression this year was that there were more women than in the past, and more young people, and about as few blacks as usual (very few). Now given that I don't ordinarily notice the color/race of folks in a crowd, I once again did my unscientific survey, sitting in the same very wide connecting corridor I did in 2006 (I didn't count in 2007 for some reason), and about the same time of day, but on Friday rather than Sunday, and counted people who passed by. I didn't try to count Hispanics as I can't reliably recognize all Hispanics just from looking, but I saw few if any that were "obviously" Hispanic. Nor did I try to judge age, of course. This compares with zero percent black in 2006, and 28.5% female. So it seems the numbers of females weren't actually higher than two years ago (which is why I count), and I have no figures for last year. Boardgame News posted a notice/link about my "What's Important" post a few days ago, that elicited a few comments (one an ad hominem attack, my thanks to Christopher Dearlove for answering that better than I could have). "And I’ll disagree with one of his statements. DO design for yourself. Not only do you have to take enjoyment in testing the thing to death, but you have to beleive in your own product if you are going to attempt to sell it." the box is a little harder these days." Granted he's talking about videogame designers, and it certainly applies strongly to video game design students, but the point applies to non-electronic game designers as well, I think. Last week I attended Origins in Columbus Ohio for the fourth or fifth time in a row. Origins changed their name to Origins Game Fair, a very good idea intended to attract a more general clientele. They also instituted a weekend-only $10 admission so that "the unwashed" could come into the exhibit halls and buy something, and watch all the gaming. But the attendance in the vendor hall, except on Saturday, was significantly less than in the past. Even in the gaming halls there seemed to be considerably less going on, despite the Pokemon National Tournament and a record number of events. Last year there were something like 15,000 unique attendees, likely fewer this year. It's easy to attribute the attendance dropoff to the price of gas. What concerns publishers is whether people will buy fewer games because of gas prices and general uncertainty. Conventional wisdom is that when the economy is poor, people steer their entertainment dollars toward the less expensive (per hour) forms of entertainment, which includes games (especially non-electronic games). One vendor pointed out that games are now cheaper, in comparison with gas and other necessities such as food, than they used to be. But another worried that when it came time to buy a game, a person would need the money for gas. I go with the conventional wisdom. The people who came to the convention were willing to spend money, it's just that there weren't as many people as in the past. Nor were there as many exhibitors--or maybe I should say, the exhibits occupied less space--especially the huge exhibits we used to see. Why? Let's speculate. At a remainder vendor I ran across a box of 12 starter sets (30 chips in each) of Clout Fantasy. Clout was heavily hyped at last year's convention, originated by a company involving Peter Adkison, founder of Wizards of the Coast and owner of GenCon. It is a collectible throwing game. You throw the equivalent of high quality poker chips with color illustrations on them into an area, and rules plus measurements govern what happens. I confess last year I didn't think it would appeal to many people, and this box may well confirm that. Clout starter sets were $14.95 at Thought Hammer (knocked down to $8.97). So my $8 box retailed for $180 at one time. The principal publisher, AEG, used to have enormous layouts at Origins, but had a tiny booth this year. But this was not as striking as the absence of WizKids for the second year running, after they had brought enormous setups to past Origins. Wizkids made their fame with Mage Knight, HeroClix, and the like. Mage Knight figures were at the same remainder vendor, as well as Navia (chesslike game using collectible figures, also pushed heavily at the convention in the past). I couldn't resist, and bought a dwarven steam behemoth (a tank, more or less) for $4 (original price $34.95 in 2001). There were even some D&D miniatures sets in the lot. Of course, another vendor had literally thousands of RPG books at $5 apiece. This only confirms what we all knew, that the RPG market is in the pits, though the advent of 4th Edition D&D (which renders all the D20 Third Edition stuff obsolete) may have had something to do with this particular display. RPG market: Andy Hopp, a guest of honor artist who works in the RPG industry, gave another illustration of the collapse of the RPG market. When he started about seven years ago, he could get around $80 for a black and white illustration in an RPG book. He doesn't work in that segment now, but understands people are lucky to get $10 for the same thing. That's because, outside of the main vendors such as Wizards of the Coast, companies can's sell much RPG material, so they can't pay much for art. I didn't notice Wizards of the Coast, whether they were there or not. We had the usual contingent, perhaps more than usual, of little companies with a few new self-published games pushing them at Origins, companies we won't see back next year, as usual, because it won't have been worth the cost/effort. But hope springs eternal in the human breast, as they say. I didn't investigate, but a game that caught my eye was a spiral array printed on black cloth, with two different colors of dice (not d6) layed out on it. As a result I'm thinking about using dice as pieces for a game, but D6, not the more expensive stuff. The little companies, the boardgame companies, that have been around for a long time were still there (most of them), but the big companies were not as much in evidence. Perhaps WizKids and Wizards of the Coast will be at GenCon, which is more fantasy-oriented than Origins. According to the organizers there were 4,527 events at Origins--tournaments, role-playing/miniatures/bardgaming sessions, seminars. One of the oddities of Origins is that you pay quite a hefty fee to get in--up to $70--and then you're charged to play the games, and even some of the seminars that you attend. (This in contrast to WBC, where you pay one fee and then can play in any tournaments, and play anything else.) At Origins there's even a fee for playing in the open boardgaming area. But the result is LOTS of events. I did my usual two free seminars, how to get your game published and how to design a game. 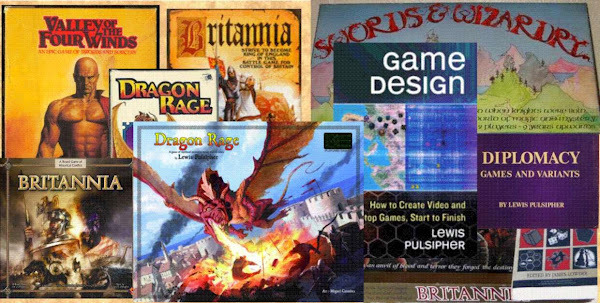 (Slides and MP3 recordings here, including also Ian Schreiber's "Game Design for Teachers", http://pulsiphergames.com/teaching1.htm.) I had more than 25 at each session despite choosing slightly odd times (9 AM and 3 PM Saturday). As seminars go, this is very good attendance. Listening to myself, I seem to have been in good form, and I'll use the recordings to help me write the book. Why did I buy the Clout set? For pieces for prototypes, I get outstandingly made "poker" chips in four colors for two+ cents each, and can ignore the illustrations. But I realized after I'd bought, I can use these for game design "challenges" in class. I'll give student groups a starter set or two, tell them to use one of the three sets of numbers on the chips, and make up a game (most likely with a square board, but that's up to them). Unfortunately, the other set was gone when I thought of this and wanted to buy it as well! What's important in breaking into the (non-electronic) game industry? Don't think you're going to make a lot of money. Very likely, you'll spend a great deal of time for little return. Non-electronic gaming is "small potatoes", not a big source of money. "How do you make a small fortune in the game industry? Start with a big fortune." Sorry, folks, while you're really important to yourself and your family, you're nobody to any publisher. Don't design games for yourself, design for others. They’re the ones who must enjoy it, your enjoyment in playing is unimportant! But don’t design something you expect you’ll dislike. If you're only working on one game, or a few, you're not likely to end up with a good one, AND you identify yourself as a dilettante, an amateur. Pros are working on many, many games. Patience is a virtue. Britannia existed in fully playable form in 1980. It was first published in 1986. In 2008, one publisher told me, "it's a good thing you're immortal, because it's going to take a long time" to evaluate and publish one of my games. So if you're the "instant gratification" type, recognize your instant gratification will be in seeing people play your prototype, not in the published game. Self-publishing is practical, if you don't mind losing a lot of money. Moreover, at some point you become a publisher/marketer, not a designer. What do you want to do? In describing Britannia to potential players, I often say it has a chess-like quality. You have to pay attention throughout the game, as losing out on a few points in the first few turns can mean the difference between winning and losing many turns later. It is a game that rewards some planning, though owing to the variability of combat, you also have to react to surprises from the dice as well as from the players. In chess you can survive going down a pawn early in the game, but if you really screw up and go down a rook or queen, you've had it. Similarly in Britannia, if you make a big error--say, as the Welsh, fighting the Romans to the death instead of submitting--then you can't win the game, and face hours having to deal with that. While some people play games to enjoy the process, the journey, some play to win, and don't care to play when they feel they cannot win. In chess you can resign (surrender) and play another game, not easy to do gracefully when there are three other players instead of one. This chess-like quality is quite in contrast to many Euro-style games, where you can more or less foul up throughout the first half or more of the game and still have some chance to win in the end. Insofar as many Euro games are "family games on steroids", this characteristic is to be expected. I think expert Brit players would say that bad luck can be managed, as long as there isn't a really long run of bad luck. Less expert players often think the game can revolve around a few rolls. To my mind, most rolls in Britannia are not important out of proportion, unless someone is desperately trying to kill a rival king in the endgame. Dice can be managed in Brit just as they can be managed in D&D. "What?" Yes, in (first edition) D&D you can try to minimize the number of times you MUST get lucky. This is the same as how you ought to manage life, trying to avoid times when you MUST get lucky. So smart people wear seatbelts, some people don't. Smart people exercise, some people don't. Smart people don't smoke, some people do. And so forth. Example: players who do lots of one-on-ones with the Romans are taking unnecessary risks, I think--living on borrowed time. I try to avoid it. I think a conservative Roman can still score his 80 by round 3, and have more Roman armies left to defend his holdings. Yeah, "fortune favors the bold", but sometimes you don't have to be bold and can still get the job done. There are three prominent alternative methods: one uses battle cards to add to the strength of combatants, and each player has an identical deck of 25 cards (five in hand). Over the course of a game, then, the "luck" each player has will be about the same, because they have identical decks. A second method uses "picture dice" (which are really just marked with the equivalent of 4, 5, and 6 when you come down to it), each army rolls two dice, and two hits are required to kill an army. The third method uses a table. One table "evens out" luck quite strongly, another not as much. The first cross-references the number of armies and a die roll, the second uses odds (but all possible odds are listed on the table, so that players don't have to figure out odds--people aren't used to doing division in their heads any more). People like picture dice and cards. Wargamers are more used to tables. All of these methods have been extensively playtested, and all of them work, but accomplish somewhat different objectives and have different expenses (200 cards, for example). I am working on the "Gateway" version of Normannia--have played twice, seems to work despite being on a larger board (33 areas) to accommodate the bigger diceless version. Now I'm looking at a three player version, but whenever I do this I seem to run into problems with nation interaction. It's very difficult to avoid strange interactions with three players. It reminded me of the "four color map" problem. "The four color theorem (also known as the four color map theorem) states that given any plane separated into regions, such as a political map of the states of a country, the regions may be colored using no more than four colors in such a way that no two adjacent regions receive the same color. Two regions are called adjacent only if they share a border segment, not just a point. Each region must be contiguous (http://en.wikipedia.org/wiki/Contiguity): that is, it may not have exclaves (http://en.wikipedia.org/wiki/Exclave) like some real countries such as Angola (http://en.wikipedia.org/wiki/Angola), Azerbaijan (http://en.wikipedia.org/wiki/Azerbaijan), Italy (http://en.wikipedia.org/wiki/Italy), the United States (http://en.wikipedia.org/wiki/United_States), or Russia (http://en.wikipedia.org/wiki/Russia)." I'm trying to do the same to accommodate just three players, and it's very difficult to do. Even without the "petty diplomacy problem"--that one player, if he decides he cannot win, can determine which of the other two can win--it makes three player strategic map-based games difficult in general. There are ways to overcome the petty diplomacy problem, and if you have just three nations you can have three players, but when you start trying to use many nations, it becomes really difficult to do well. I am known to some as a person who doesn't actually play boardgames, other than his own--but I do play the role-playing game Dungeons & Dragons. I don't even play my games once they're published, though I'll play variations. Except for D&D, I'm always interested in the design aspect of playing a game, that is, improving the designs I'm working on. Moreover, playing a game that is less than top standard is too much like work. And some games (like chess) are too much like work in any case. I am much happier watching or reading the rules than suffering through playing. When I used to play boardgames, I played "for blood", to win. But about age 25 I got to where I disliked the competitiveness, what it did to me, so I stopped playing competitive games. D&D is a cooperative game, at least the way I play it. At Rick Steeves' Game Night recently, I played my new dice game that uses Law & Chaos principles, to make up the numbers; I didn't play Warhamster Rally but learned a lot from watching and reading the rules, yet I didn't have to concentrate on it. (I'm designing a "Rocket Rally" game, sort of broad market using RoboRally principles, so I was quite interested in WHR.) I also watched part of a Forumula De game, very clever yet not offering something I can use in any game I'm working on--not yet, anyway. I also had a look at TransAmerica. I'm always looking for methods and ideas that might help me, yet most of the games played at Rick's are Euro types rather than wargames, and most of the games I design are at least in part wargames, certainly conflict games. I've been thinking about where variability comes from in games, especially wargames. Obviously, much of it comes from people, that is, from the opposition. And when there is more than one opponent, the variability becomes much less predictable. Some computer games try to reproduce some of this kind of variability, for example Civilization. In Civ IV the different "personalities" of the opponents are supposed to influence how they play. It often appears to me that expert "Euro" game players are playing the players more than the system, though some of the more intricate mechanics mean the main point of effort is understanding and "controlling" the mechanic rather than understanding and "controlling" the people. Britannia--the combat system, that is, the dice rolls. In many of my Brit-like prototypes I'm trying to cut down on the randomness of the combat. Though 75% of the players think the amount of luck is OK, most others would like less luck. I laugh at people who say Brit is "too scripted", there seems to be great variation in what happens owing to both differing strategies and dice rolls. Freeform would make no sense in an historical game (note that Vinci and Risk, below, both freeform games, have NO element of history in them, absolutely none). Vinci--the chit draws for the civilizations provide a random element. It is also very freeform. But mostly it is the people. Risk--the combat system is the obvious variable, but even more, the territory cards and increasing reward for turning in sets; also there's the extremely freeform structure (you can go anywhere). Diplomacy--there is occasional guessing in the tactics, but this game is almost entirely about people. Someday I may do a version of Dip stripped to its essentials, where there would be little or no tactical element, or perhaps a kind of a "Euro" version of Diplomacy (this might end up being two different games). In most wargames, the dice rolling in combat is the main variable other than the people themselves. And that makes sense, combat is a very chancy business no matter how well-prepared you may be. In many other games, especially those with little or no luck in the combat system, the Event Cards provide the variability. (E.g. Germania, Seas of Gold, Law & Chaos (yeah, that's not a wargame), etc. Some games become "predictable" for lack of a random element other than the players--chess, checkers, Puerto Rico, etc. Yet when they are complex enough, there's still a lot of unpredictability. Checkers has been brute-force solved by computer, but that doesn't prevent people from playing. I'm not sure where that gets us, but there it is. I realized then that I never have been much interested in games with hundreds of pieces. My early favorites were Milton Bradley games like Broadside, then I discovered Avalon Hill games but preferred such as Stalingrad (100 pieces) and Arfika Korps (likely not many more). Then I went on to Diplomacy (34 pieces), and finally D&D (a dozen pieces). Britannia and the other games I had published in the early 80s and earlier had fewer than 200 pieces, often less than 100. And even those games don't have more than an average of 55 or so pieces on the board at one time (Britannia). Of course, I like "grand strategic" games, not tactical games (D&D is the aberration there), and at that level a lot of different categories of pieces doesn't make much sense. Maybe a game with hundreds of pieces but few categories would be all right, but I'd then say, what can we do with hundreds of pieces that we cannot similarly do with dozens? The A&A game reminded me of my stillborn WW II strategic game intended to provide the strategy of A&A without the length and number of pieces. So I may go back to that. I have already played the "broad market" Brit (which is really a gateway Brit, not broad market, that needs to be a game with cards). And miraculously, I've already written a full set of rules. Followed by a full set for Frankia. Maybe I'm finally "off the snide". Gary Gygax, one of the inventors of D&D, died recently. I'd call Gary the developer of the game for sure, I know Dave Arneson originated the idea of having individuals interact with fantasy miniatures battles (which became Chainmail), as Dave wrote me a letter about it when I was editor of my Supernova fanzine. I don't know how it got from that to strictly individuals as we see in D&D. I first corresponded with Gary in 1966. He was a leading light in the International Federation of Wargamers club, and about all I recall of that exchange is him saying he was too young to be called "Sir". And he was, then. I only met him once or twice, at conventions, and had had no contact with him for many many years, but something like this is much like the feeling when sports heroes of your youth die (Micky Mantle!). You feel old. "Where’s a Cleric When You Need One? – Gygax Dies at Age 69"
They need to find a new headline writer. D&D, the older, simpler version, is still my favorite game, and I recently started playing--well, reffing--again after a three year hiatus. Why would I want to design electronic games? I'm better off as is. For most of the age of video games, you had to work full time in the industry, yet the pay was and is poor. I'd rather help young people as a teacher, get paid at least as well, and have lots of time to design games. The working hours are bad. "Crunch time" (unpaid overtime) is common, though designers are not involved in that quite as much as programmers and artists. Fighting with the electronics obscures the purity of design. You worry about what the computer can do instead of what the players can do. I attended the 15th annual PrezCon in Charlottesville, VA 21-24 February. Rick Steeves and I arrived later Thursday evening, PrezCon is a miniature WBC (World Boardgaming Championships), with the focus almost entirely on board (and card) game tournaments. Registered attendance was over 550. Justin Thompson, who runs the con, says it has grown larger every year. PrezCon is purely boardgames and non-collectible card games--no role playing, no Magic or Yu-Gi-Oh, no "pure" miniatures (there was a Star Wars Minis tournament), no electronic games. I don't go to conventions to play games, and I don't have much luck getting people to playtest because they're so busy with the official tournaments. Players pay a single fee and play as many tournaments as they can fit in, with wooden plaques for the winners. Most tournaments have two or three heats or rounds, then the most successful players play in a final. GMT, Mayfair, Z-man, Cafe, and other game companies were there, but the vendors are a minor part of the convention compared with Origins. It really is a miniature WBC. I've been at PrezCon every other year since 2004. I noticed this year that there seemed to be more kids (under18), and more folks in their 20s and 30s, and more females, though the most common demographic was still a gray-haired male. Some of those kids are offspring of the older folks, but the increase was certainly noticeable. Early Friday I talked with Jason Hawkins (co-designer of Parthenon) at length about his elaborate but quite clever prototype game of Alexander's successors. I'm afraid Jason thought I was a curmudgeon with my questions about the complexity of it--I seem to be more and more into simple games these days rather than ones with a lot of detail. I also watched a bit of Richard Berg's prototype Dynasty (China) game being played, and skimmed the rules. Berg was also playing a cowboy game that he called a "growth game"--someone asked what had happened to him, as he's very well known for nuts-and-bolts wargames--but there was some gunslinging in it. Dynasty also appeared to be more about about growth than about war. Evidently Richard likes to write a full set of rules fairly early on, rather different from my typical practice (though I write the first-draft rules for quite simple games pretty early in the process). The most useful thing I did was talk with Ron Magin of Cafe Games about my prototype Law & Chaos. He, Rick, and I played, and he then recommended to Pete, CEO of Mayfair Games, that he should try it. Pete talked at some length about where he has games printed (US, Germany, occasionally China, depending on what needs to be printed). The US has become cheaper than Germany owing to the high value of the Euro (or low value of the dollar, depends on how you look at it). Mayfair is one of the larger US publishers, in particular having the US franchise for Settlers of Catan, which sells in enormous numbers (six figures). There was a small Britannia tournament, two rounds and then a final board, won again this year by Mark Smith in a tight game. About a third as many people participated as at WBC, which fits the attendance numbers (WBC is 1,500+ attendees). Though I don't play at conventions, I look at lots of games in progress and talk with various people, and get a lot of good game ideas at a con. One in particular (using techniques from Law & Chaos) is likely to turn out well. Another is a space-themed, broader market, analog to Robo-Rally, my friend Rick's favorite game. Rick also played an eight hour Axis & Allies game, which reminded me of an old project I had to try to make a two hour WW II game that concentrated on the virtues of A&A (strategy) rather than its "unvirtues" (lots of dice, economy-driven, LONG). Many notes and much discussion took place, but I don't know if I'll get any further this time than last. At the con I heard about a "broad market" (as opposed to mass market) version of a famous gateway game. That gateway game is quite simple, but this version is MUCH simpler, to appeal to a broader market--people who don't normally play boardgames at all except for Monopoly and such (I think), and who might buy them in places like Target or Macy's. Just for the heck of it, I'm trying to develop a "broad market" version of Brit (the kind of thing that would sell with Risk and similar games). History may be too serious for a broad market, especially medieval British history, but it's an interesting exercise. I already have a "Brit Lite" version, and that can be played by casual gamers and video gamers, but I'm aiming at the sort of folks who might play Risk and Monopoly and checkers or chess, but not much else. I'm doing this for my own amusement, not with the idea of ever having it published. At PrezCon this weekend I heard about a "broad market" version of a famous gateway game. That gateway game is quite simple, but this version is MUCH simpler, to appeal to a broader market--people who don't normally play boardgames at all (I think), and who might buy them in places like Target of Macy's. Just for the heck of it, I'm trying to develop a "broad market" version of Brit (the kind of thing that would sell with Risk and similar games). History may be too serious for a broad market, especially medieval British history, but it's an interesting exercise. I already have "Brit Lite" version, and that can be played by casual gamers and video gamers, but I'm aiming at the sort of folks who might play Risk and Monopoly and checkers or chess, but not much else. The game would have to have many fewer units than Brit, and many fewer areas (my first cut has 14 instead of 37 land areas). Six turns perhaps, 8 nations. I'm afraid that with the limits required, the Roman conquest must be left out. Non-gamers might not care for the one-sidedness of it, but more important, it will tend to go the same every time, so let's not bother. Obviously, there should be plastic figures for pieces. Leader pieces? No, I think the way to introduce historical flavor (and some variation) is with cards. Those cards can include leader cards that the player will always get on certain turns. I have a system for possible double occupancy of areas that works very well in Frankia (and Brit Lite), but it's a little complex. So I'm waffling between having more areas than the 14 I came up with, or 14 and double occupancy, or more areas--but that might mean empty areas, and might require more pieces. Dunno until I try something. Or maybe more areas to avoid double occupancy? But then areas might be empty, that's the problem. That's all for now. I have many other things to work on as a result of PrezCon contacts, I'm glad to say. This is written with my students of electronic game design in mind, but should be of interest to boardgamers. The best way for students of digital game design to learn game design is with non-electronic boardgames and card games. This kind of game can be brought to playtest stage far more quickly than electronic games, and by their relatively simple nature they reveal the essence of gameplay much more quickly and clearly than electronic games. However, my students are rarely familiar with non-traditional boardgames such as Eurogames, and the traditional ones offer many “false lessons”, that is, what has worked in traditional games is often not good game design. Put another way, game design students often adopt characteristics of traditionally popular games in their designs. Part of the reason for discussing traditional games is to point out that they are not necessarily designs worth emulating. So I’ve tried to write a brief analysis of what is wrong with (and right with) some of these games. Sometimes I’ll use the following questions as a framework, after a general discussion of the game. 1. What are the challenges the player(s) face? 2. What actions can they take to overcome those challenges? 3. What can players do to affect each other? 4. Is the game replayable many times without becoming "just the same" over and over? 5. Is the game fair? 6. Is there an appropriate mixture for the audience and game type (consider "take that")? 7. What is the "essence" of the game? There are two types of “traditional” games, the public domain ones that have come down to us over centuries such as chess and pachesi, and those that are commercially-produced games that have become habits with the buying and playing public. The former tend to be for two players only, while the latter are often for two or more players. I must say I am NOT a person who thinks that recently-designed games are necessarily better designs than “old” games. I am definitely not into “the cult of the new”. But I do believe that the really old traditional games often benefit greatly from the lack of competition when they were first devised/published. Most “traditional” games are played because “everyone knows how to play”. They are bought because “everyone is familiar with it”. They are not traditional because they are particularly good game designs, in many cases. They have attained a place in contemporary culture, have become “a habit”. When you ask boardgame fanatics how well such games would fare if published today, the response is often something between “a dog” and “just another game”. I have one general comment about the “roll dice and move accordingly” mechanic used in many commercial traditional games. This mechanic gives a player little to no control over what happens. It is almost universally despised by experienced boardgamers. I pose it to video gamers this way: “if you were playing a video game, and your avatar suddenly slowed down for a while, and then sped up for a while, and periodically changed maximum speed at random, wouldn’t that annoy the heck out of you? And what if other player’s avatars were moving at different speeds than yours? You’d hate it. So why would you want to do that in a boardgame?” Yes, it’s easy randomization, but there are better ways to randomize, and in any case don’t we usually want to make games of skill, not games of chance? I may as well dispose of a class of traditional games here: Bingo, Candyland, and Chutes and Ladders are all entirely random games. This is OK for little kids, who don’t recognize the randomness, and who aren’t up to “strategizing” to beat older players. It’s OK for gambling, too. But it’s worth nothing to people who like games involving skill, who want to take actions to overcome meaningful challenges. Another point worth discussing is player elimination. Insofar as multiplayer (more than two) traditional games tend to be family games, the possibility that players can be eliminated is undesirable. The argument runs, when a player is eliminated, he’s no longer part of the fun. The counter-argument is, why stay in the game when you don’t have a chance to win? My response is that in family games the purpose is not to win but to enjoy socializing with your family, and there is more interaction if you’re still in the game even if there seems to be little chance that you can win. Some games, such as Careers (one of the best traditional games, but evidently out of print), do not include player elimination, but some do, including our first subject. As this is the game people often think of first, I’ll discuss it first. Monopoly is a “family game” with a leaning toward adults. It is an average game at best, though quite despised by many boardgame experts. The “roll and move” mechanic is the first point of complaint, but there are others. There is a dominant strategy--buy everything you land on, if you possibly can, early in the game. This leads to the strong possibility of stalemate, as players may choose not to trade properties to make the sets that allow house building. Consequently, there is a strong possibility that the game can go on for many hours with experienced cutthroat players. In any case, it is a long game–-my students often say they’ve never actually finished a game. Further, the game works poorly with fewer than four players. 1. What are the challenges the player(s) face? The player must get sets of properties, construct buildings to raise the rent, and avoid big payouts. 2. What actions can they take to overcome those challenges? Not much. Movement is random, and decisions are fairly simple. Trading is a major action, as is management of funds (how much to spend on buildings, how much to hold against the possibility of paying large rents). 3. What can players do to affect each other? Trade properties. Otherwise, next to nothing. 4. Is the game replayable many times without becoming "just the same" over and over? Replayability is low, I think. The game quickly becomes repetitive. Few people actually play Monopoly a lot in a short stretch (say a year), but they may play a lot over a very long period, where they will forget how repetitive it actually is. 5. Is the game fair? It’s symmetric, and the advantage of moving first doesn’t seem to make much difference in the long run. There are no “take that” cards to drastically change the game, though a bad roll or two can be deadly. 6. Is there an appropriate mixture for the audience and game? It’s a family game, and there can be big changes in fortune depending on the dice rolls, but it seems appropriate to a “game for all ages”. 7. What is the "essence" of the game? Theoretically it’s a real estate trading and development game, but the emphasis is on the chance of movement rather than on the trading, unfortunately. There are many variations of Monopoly, in fact most people don’t play according to the rules. I’ve never thought about how to “fix” the game, but one notion that comes to mind is this: instead of playing through rolling around the board a few times, why not allow players to choose some properties to start with? This could be arranged to remove the advantage of playing first, as well. So players might write down a list of five properties (no two from a particular group such as the red properties or the railroads). All are revealed, everyone pays for their first choice (or next, if there’s a tie), etc. until all have three (not five). Then play proceeds. An interesting variation from Boardgamegeek is, every unowned property landed on is auctioned! The “lander” does not get an opportunity to buy before the auction. As with most traditional games, Monopoly has a very poor score on Boardgamegeek: http://boardgamegeek.com/game/1406. Here is a traditional simple game popular with kids. It is so simple that it has been “solved” by many, and it’s easy to write a set of instructions to follow that will result in a draw every time, or a win when it’s available (I have done so). The problem is that there’s a dominant strategy, which amounts to “occupy the central square whenever you can”. A major advantage of the game is that there is no chance, other than the big difference-maker of who plays first. The major value of the game is to teach kids that they can play a game and not understand its strategy, but as they get older they can learn to be a perfect player in its context. A much more interesting variation on this game is a four by four grid. You win with four in a row or four in a square. I am not going to ask the seven questions, which would be overkill here. BGG: http://boardgamegeek.com/game/11901. I have not played this game in 40-50 years, but it is simple enough for limited comments. It is a race game dominated by chance (roll-and-move again). It does have the virtue that more than two can play. There is some strategy in the use of blockade, either to stop opponents or to clean up behind the blockade by “hitting” stopped opponent pieces. The frustration factor can be high when you’re the one who’s blockaded. Next I’ll turn to the ultimate Western traditional strategy game, Chess. Chess rules are fairly complex for a traditional game, though it’s really quite simple to learn and play. The play is very complex and highly strategic, of course. Theoretically the game may represent Indian (subcontinent) warfare, but practically speaking it is abstract. Also unlike most traditional commercial games, there is no chance element other than who moves first. As with Tic-Tac-Toe, a perfectly played game will always have the same result, but because no one has specifically “solved” Chess, we don’t know which result it would be, white win, draw, or black win. In practice, as played by experts white has a significant advantage, and draws are common (55% of top-class human games, 36% of top computer-program games (Wikipedia)). One of the flaws of the game is that a big advantage accrues to those who know “the analysis” of certain situations, such as the openings. Chess has a vast literature, and the solution(s) to certain situations are known, but only to those who learn the literature. In effect, other people have done the thinking for you. Yes, this is a possibility in any game, but other games have not been intensely studied for centuries. For most people, there are too many possibilities to calculate once the game gets going. This can lead to what is called “analysis paralysis”: people cannot decide what to do and take a long time. Even when played by experts, chess can be a very long game, hence the artificial limitation of two hours for 40 moves imposed via chess clocks. Finally, many people would say there are too many draws. In a game designed today, the designer would try to find a way to avoid draws; though given the advantage of moving first, perhaps it’s best that draws are possible. I’ve read that former champion and famous recluse Bobby Fischer advocates a variation of chess that would remove the “prior analysis” advantage, at least for a while (Fischer was one of the best at knowing prior analyses when playing). IIRC, he suggests scrambling the order of pieces in the back row, imposing that order on both players. So from one side of the board you might have bishop, queen, knight, rook, rook, etc. 1. What are the challenges the player(s) face? Deploy pieces in a superior arrangement in order to take more of an opponent’s strength than one gives, and finally to capture the king. 2. What actions can they take to overcome those challenges? With perfect information, it’s all about looking ahead, anticipating your opponent, finding ways to make your opponent feel that he is defeated even if, in reality, he is not. Everything revolves around the moves of the pieces. 3. What can players do to affect each other? Player interaction is very high in a two-player, eliminate-enemy-pieces game. 4. Is the game replayable many times without becoming "just the same" over and over? History shows that it is, despite its fundamental simplicity. 5. Is the game fair? Symmetric, but significant advantage to first mover in expert play. 6. Is there an appropriate mixture for the audience and game type? Yes. 7. What is the "essence" of the game? Movement and position. This is a traditional game popularized by Milton Bradley’s boxed plastic version. It is largely a guessing game, though some would call it a “deduction” game. As with any game, you can “play the player”, predicting what your opponent will do. For example, a colleague of mine has noticed that his sons will not place their ships in the outer rim of squares. Consequently, instead of 100 squares to shoot at, he has 64. Chance should tend to award him the game most times. Beyond simplicity, there isn’t much to recommend this game. An excellent word game. I would eliminate two-letter words from the game, or at least many of the 101 “official” two-letter words. 2. What actions can they take to overcome those challenges? Very much a thinking game. 3. What can players do to affect each other? It may be possible to block occasionally, but in general, not much. 4. Is the game replayable many times without becoming "just the same" over and over? Given the complexity of language, yes. 5. Is the game fair? There may be a very slight advantage to playing first. 6. Is there an appropriate mixture for the audience and game type? Evidently. 7. What is the "essence" of the game? Creation of words preferably using uncommon letters. This is a simpler-than-chess strategy game. The game is sufficiently simple that it has been “solved” by computer using brute-force (trial and error) methods (http://news.bbc.co.uk/2/hi/science/nature/6907018.stm). As with most of the public domain traditional games, this one is only for two players. Game design students who have played hardly any commercial games, have usually played Monopoly and have often played Risk. Risk is very simple to learn and to play, with so little real strategy that there is rarely “analysis paralysis”. Although the theme is world conquest, it has abstracted the world so heavily that few players will feel like there’s a real war going on. However, Risk is a weak strategy game, and a “dicefest”. There’s a heavy dose of luck in combat and in the cards. It is a long game with player elimination, a poor combination in today’s terms. The turn-in-cards-for-armies mechanic is necessary to end the game in a few hours, but fairly random. The “Mission cards” victory condition introduced “recently” mitigates some problems, but unfortunately the missions aren’t tailored to the number of players in the game. As with Monopoly, most experienced boardgamers dislike, if not despise, Risk. 1. What are the challenges the player(s) face? Management of resources to end up with more armies than the opposition; there’s a little strategy involved in acquiring armies; and choosing the right time to try to wipe out an opponent and obtain his territory cards. 2. What actions can they take to overcome those challenges? Choosing where to attack, with how many armies. Choosing where to defend with more than one army. 3. What can players do to affect each other? When it is not a player’s turn, he is usually inactive except when attacked. However, every move affects at least two players. 4. Is the game replayable many times without becoming "just the same" over and over? Strategies are limited, but there’s a fair bit of variety. 5. Is the game fair? Symmetric, but there may be a slight advantage to moving first. 6. Is there an appropriate mixture for the audience and game type? Well, lots of people fondly remember playing it as kids, so there must be something to it. 7. What is the "essence" of the game? Some would say “interminable dice rolling”. Choosing where to attack is probably the essence. This game appeals to younger people, and actually has more choices than Monopoly. However, it is strictly a family game, and players have little control over what happens. It does have the appeal of a partly three dimensional board, and a spinner instead of dice. There’s a story involved (the story of life), and that is nearly unique to traditional games. I remember it as one of the worst games ever, but this may be too harsh. It is very positive–nothing really bad happens, everyone succeeds in life–but it may teach the wrong habits for the 21st century. The Chinese/Japanese game of Go, the analog of chess in East Asia, is an outstanding abstract strategy game. It is played on a 19 by 19 line grid, with black and white stones places on the intersections of the lines rather than in the squares. The rules are very simple, though I find them slightly difficult to grasp. The strategy of controlling areas is very deep, even compared with a game like chess. From a game design perspective, the game is so unusual that there may not be many lessons to learn.